I remember when water bottles were introduced on the Norwegian market. It was the most stupid idea I had ever heard of and could not imagine how anybody would be willing to loose their money on this bound to fail business project. Obviously I was wrong. Even in a clean country like Norway where fresh water is abundant everywhere there was a market for bottled water. Go figure. Needless to say, I do not purchase water in this country, thank you very much. I even drink tap water when I'm in continental Europe. Hell, I take my chances in the US as well. That's how adventurous I am. Plastiki and the Sydney Opera. Image courtesy of Plastiki on Flickr. Unfortunately, I am among too few who have a stomach for tap water. We produce tons of empty plastic bottles that seem to end up in the great conveyor belt and finally caught in the gyres polluting the ocean and all life in it. In Norway we recycle most of the plastic bottles (water and other beverages), but I realize that the return policy (we get money back for empty bottles) we practice is implemented in a limited number of countries world wide. Hence the mess in the ocean. I'm happy to see that at least some parts of society are waking up and trying to do something about this completely unnecessary trend of bottling up drinking water. Monday 26th July a plastic bottle catamaran called Plastiki arrived at its destination in Sydney after spending some 4 months close to the garbage in the Pacific. Plastiki passing under the Sydney bridge. I was actually on the top of that bridge once. Totally awesome experience. Image courtesy of Plastiki on Flickr. Environmentalist David de Rothschild initiated this Kon-Tiki-a-la-this-millenium and actually recruited a couple of the original Kon-Tiki farer Thor Heyerdahl's grandchildren – one of which was Plastiki diver! (what a job!) National Geographic was on board filming and I assume we'll see footage of this environmental adventure some time soon. Having a scientific background I am evidently interested in the conveyor belt and gyres enabling this voyage (both the unorganized bottles (bad drinking habits) and heavily organized bottles (Plastiki)). In simple terms it is gravity, ocean temperature, density and salinity that drives the conveyor belt while wind and rotation creates gyres. The media has embraced the Plastiki adventure and the arrival in Sydney has been widely reported, but I haven't seen anybody discussing how on Earth all the plastic ends up in the Great Pacific Garbage Patch. And definitely not how geodesy contribute to better understanding of the underlying physics driving and forming the various elements of ocean currents. So in addition to a few maps, I give you Gravity field and steady-state Ocean Circulation Explorer - GOCE, the satellite that will help us improve the accuracy of the height reference for both land and ocean topography. That is correct, the ocean has topography, just as land. 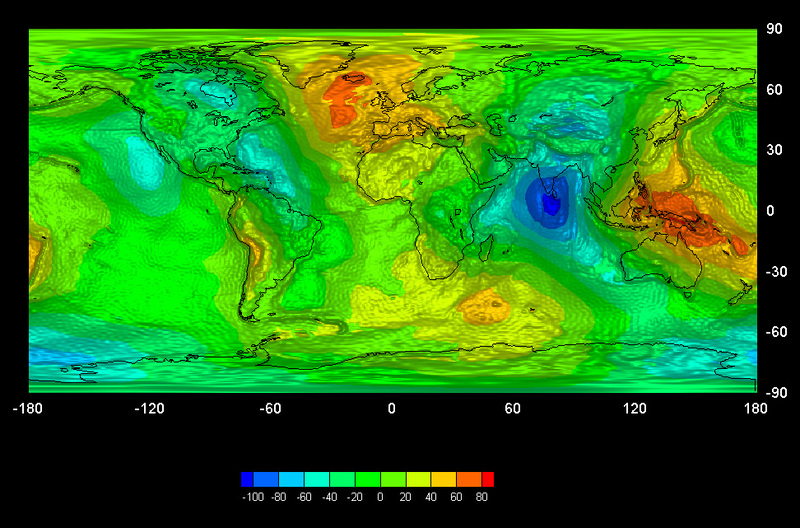 This can tell us which way the water flows on the ocean (element of the ocean currents). Learn more here and here or simply enjoy the gorgeous map created by the first patch of data from GOCE. According to GOCE general Rune Floberghagen we can expect more wonders from this satellite soon. He promised so at the ESA Living Planet Symposium in Bergen in June and I have no reason to doubt him. While scientists continue to study ocean currents, environmentalist, like UNEP, are already on the case running a number of programs that help clean up the mess. Plastiki is one initiative but there are a lot more going on with less media charm. Congratulations to the Plastiki team – and I can't tell you how delighted I am to see they hired this shamelessly young girl as skipper! And she's blond. Like me. Skipper Jo Royle (26) and expedition leader David de Rothschild (31) entering Sydney 26th July 2010. Image courtesy Plastiki on Flickr. Citizen Science Then And Now. Want To Play The Game?